In 2014, you need to run marketing campaigns that tap into the latest technologies and trends. And there's no better way to get a sense of the current Zetgiest than to sample the newest English words. From Phubbing to Selfie and Twerk to Brain Fatigue, twenty thirteen was a big year for quirky words. But from the point of marketing, a look back offers more than just a laugh. 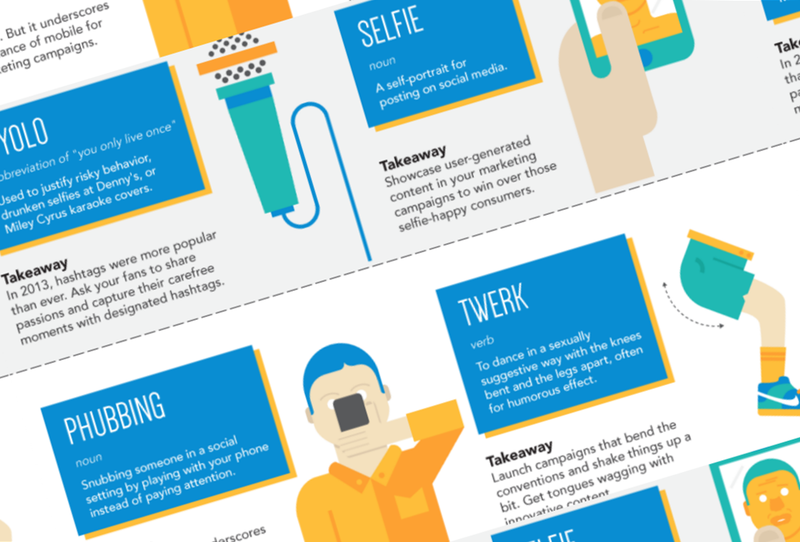 Here are some of the top neologisms from 2013 (by offerpop), and how they should inform your 2014 marketing decision. Your customers don't want to read your novel. Keep your marketing content short and integrate photos and videos attracts attention. Don't be afraid to hybridize ideas for maximal success! Build participation and awareness by paring Vine videos with email, or Hashtags with TV commercials. In 2013, hashtags were more popular than ever. Ask your fans to share passions and capture their carefree moments with designated hashtags. Showcase user-generated content in your marketing campaigns to win over those selfie-happy consumers. Rude? Sure. But it underscores the importance of mobile for your marketing campaigns. Launch campaigns that bend the conventions and shake things up a bit. get tongues wagging with innovative content. Today's consumers don't want to miss a thing - which is why they're always scrolling their social feeds. Grab their attention by consistently creating social content and launching social campaigns. Use big visuals, video, and strong calls to action to attract consumer attention without pummeling into submission. Don't be afraid to follow trends and memes - even the silly ones - if it draws eyes to your messaging.